Check out History Channel’s Invention USA on Wednesday 12/12/2012. In the episode “Fill Throttle”, the BBR Crew checks in. Break out your playbike for a great day of fun! 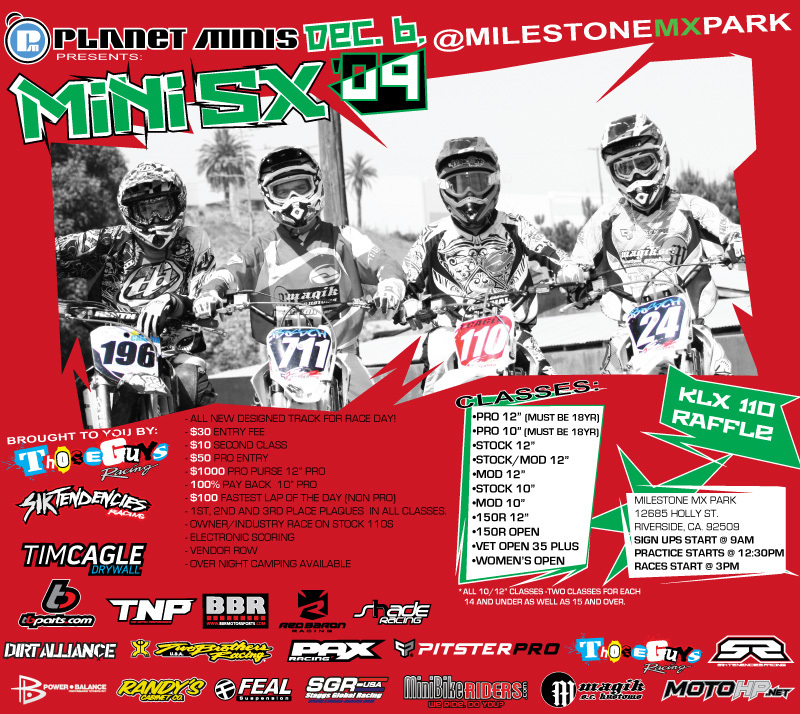 Here's your chance to get a great deal on a BBR KLX110 that is stock class and kid's class legal for MiniMoto! BBR Race Team Bikes Available Now! BBR’s Derek Costella Is Set To Defend His 10" and 12” MMSX Titles In Vegas Friday! BBR Motorsports CancelCore Quiet Inserts Now In Stock! Abrigo and Costella win 10E and 12E class. Kitaco 4-Valve Head for KLX 110. BBR is taking orders now for this revolutionary bore kit. BBR Race Bikes For Sale. A great opportunity to buy BBR race bikes. Kitaco partners with BBR Motorsports. BBR agrees to distribute Kitaco products and collaborate on research and development and race team. MiniMoto SX Friday, May 2nd 2008-Register Now!. Increase the air flow and performance of your KLX110. BBR offers complete product line for the 2008 TT-R125. 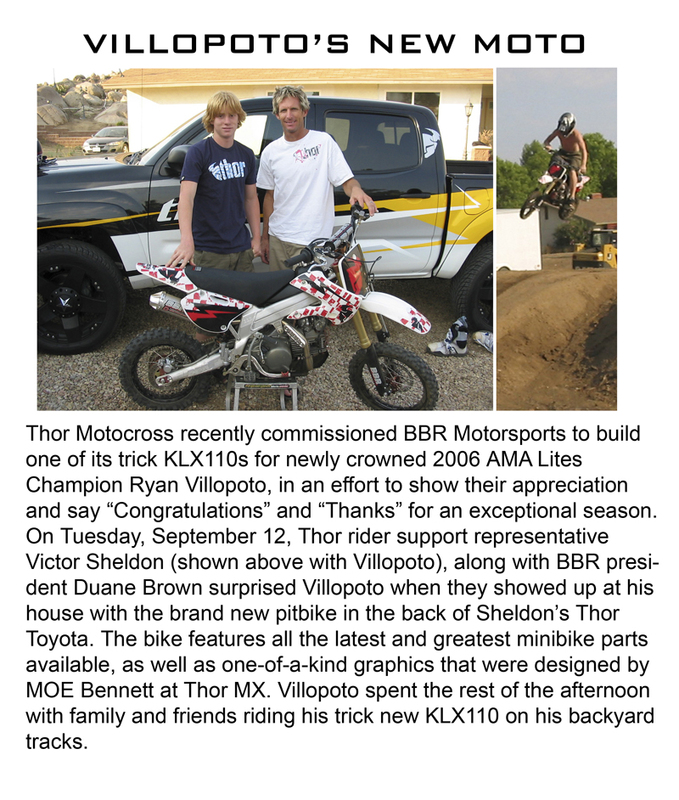 The Brown Brothers have adapted BBR's E-6 Technology to the KLX/DRZ110. 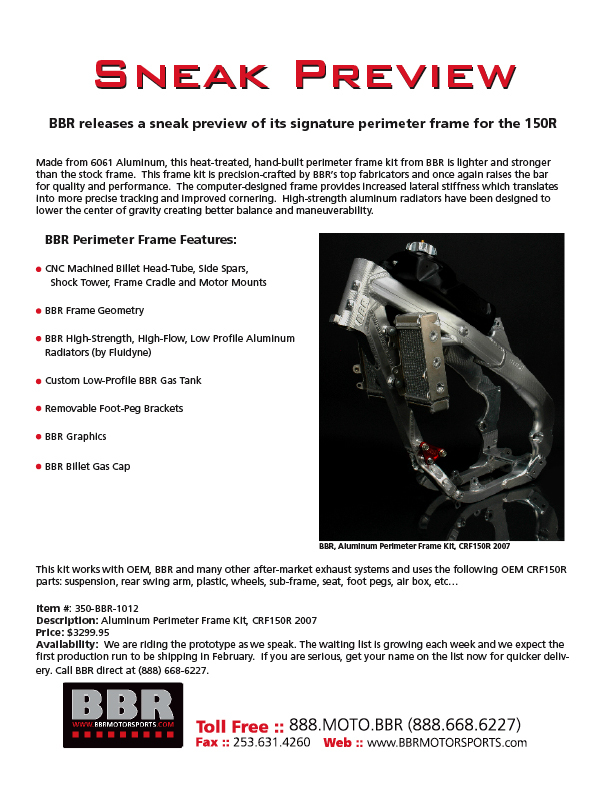 BBR introduces new lightweight Aluminum kick starter for the CRF150R. 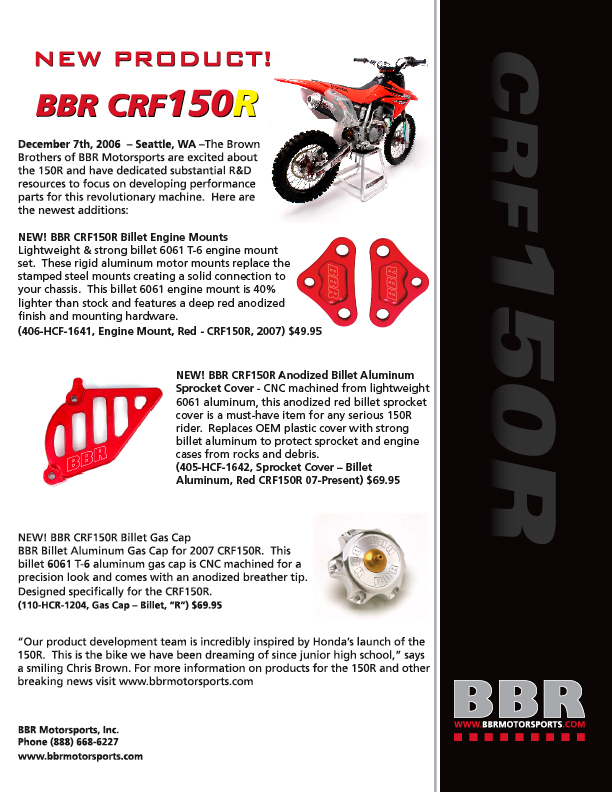 BBR Motorsports launches new chrome logo graphics for the CRF50. You Can Now Upgrade to a High-Strength Aluminum Throttle Tube for BBR Throttles. Here is a sneak peek of Rich Taylor's new line of Goggles. Dirt Bike Tests BBR 150R Perimeter Frame. BBR Launches New Chrome Logo Graphics for KLX 110. Transworld Masters_of_Mini Aug. 21st - Dec. 8th. 7075 T-6 aluminum and features an R-5 anodized finish. Own a piece of MiniMoto SX history with your own BBR/Monster Team graphics kit. BBR/Detailed Bike information now available! BBR Adjustable Linkage with 5 ride height settings available now! BBR reaches settlement with Workz Industries for infringement of BBR Patents. Jeremy McGrath and BBR Motorsports build three Monster bikes for MiniMoto SX. BBR/Monster Race Team Bikes For Sale After MiniMoto SX. BBR announces the BBR Heavy Duty Forged Output Shaft for the KLX110. The BBR engineers have designed a high-strength forged aluminum frame cradle for the TTR125. 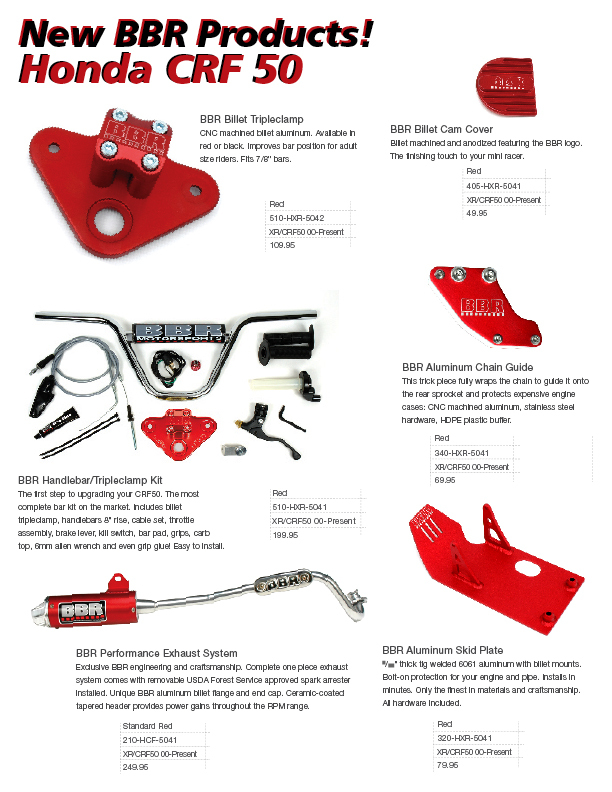 BBR has added a new color to its Honda CRF 50 products. World Premier of the New BBR 150R Perimeter frame Works Bike. BBR releases a sneak preview of its signature perimeter frame for the 150R. BBR billet engine mounts, sprocket cover and gas cap now available. BBR Motorsports and Monster Energy Drink sign Derek Costella for the 2007 season. BOSS Team visits BBR to get latest performance upgrades. Read about the trick CRF50 the crew at BBR built for the David Bailey benefit auction. 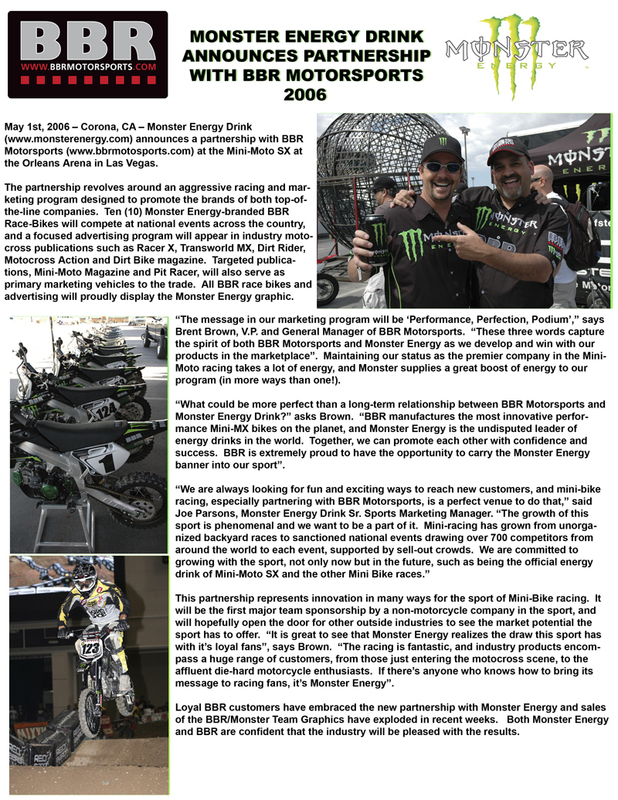 Monster Energy Drink announces partnership with BBR Motorsports 2006. While in town for the Seattle Supercross, BBR presented Ricky Carmichael with a new BBR Perimeter DRZ110. Travis Pastrana has 3 new BBR DRZ110s! Two are SuperMoto and the third is in full motocross trim. Darcy Lange (2 time Arenacross champion) has been testing with BBR getting ready for the Las Vegas MiniMoto SX. BBR Motorsports, Inc announced several new products today at the Indy Dealer Show. Honda Announces new CRF50F at the Honda Dealer Show in Las Vegas! Check out the April 2003 issue of Roadracing World magazine for an interview with Ben and Eric Bostrom talking about their BBR aluminum framed XR50s. Arenacross Riders ride with the BBR Gang. Jimmy Lewis Rides The BBR MM12P- VIDEO! Duane Brown and Jimmy Lewis discuss the Husaburg 570 - New Video! International Spotlight Shines on Costella and his BBR/Monster Mini. Jeremy McGrath's Weapons Of Choice. Predictions From The MiniMoto SX Champ. Dirt Bike Magazine tests new BBR product for the 150R. MXA Interviews Brown Brothers about knock-off of BBR Parts. BBR is recognized as a true innovator in four-stroke in fabricating custom dirtbikes and have been doing it for many years. 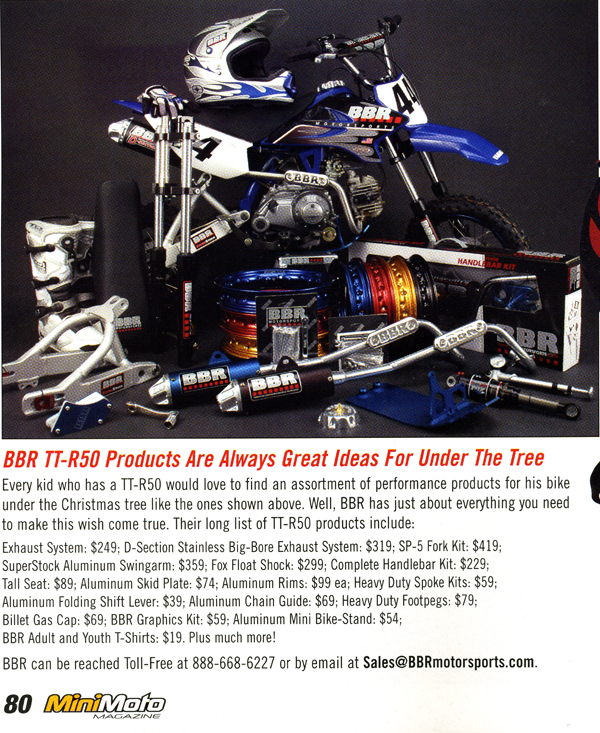 Check out the Feb 2005 issue of Motocross Action Magazine for a test of the BBR aluminum framed Mini CRF250R! Check out the January 2005 issue of Dirt Rider Magazine for an in depth test of Ricky Carmichael's BBR aluminum framed DRZ110! Check out the June 2003 issue of Motocross Action Magazine for the ''Eight Must-Dos For XR50 Racers''. Check out the May 2003 issue of TransWorld Motocross Magazine. It features a full story on the history of BBR Motorsports. Dirt Bike Attack of the Mini Thumpers! Bring your 50, 110, and 150s and race indoors at Oakwood Arena near Spanaway, WA, March 21. Bring your 50, 110, and 150s and race indoors at Oakwood Arena near Spanaway, WA. First race Nov 15. 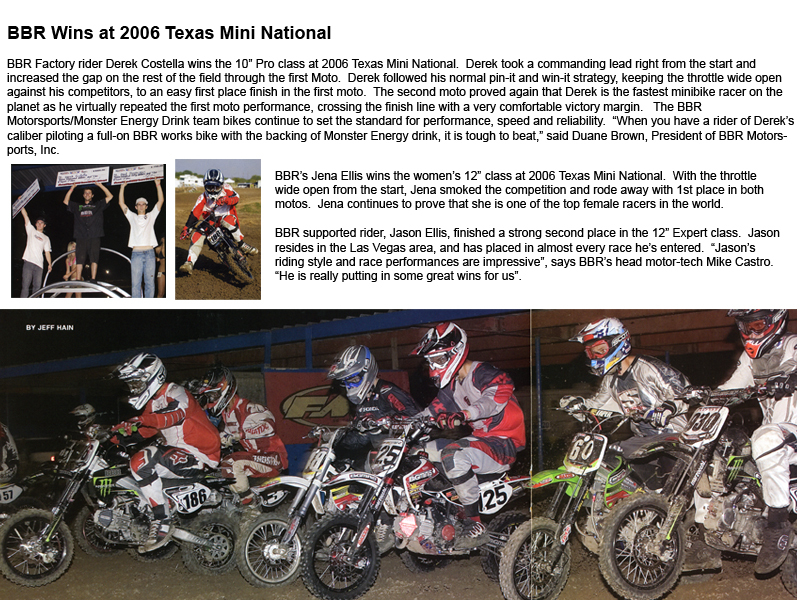 Congratulations to all the riders at the 2009 MiniMoto SX! 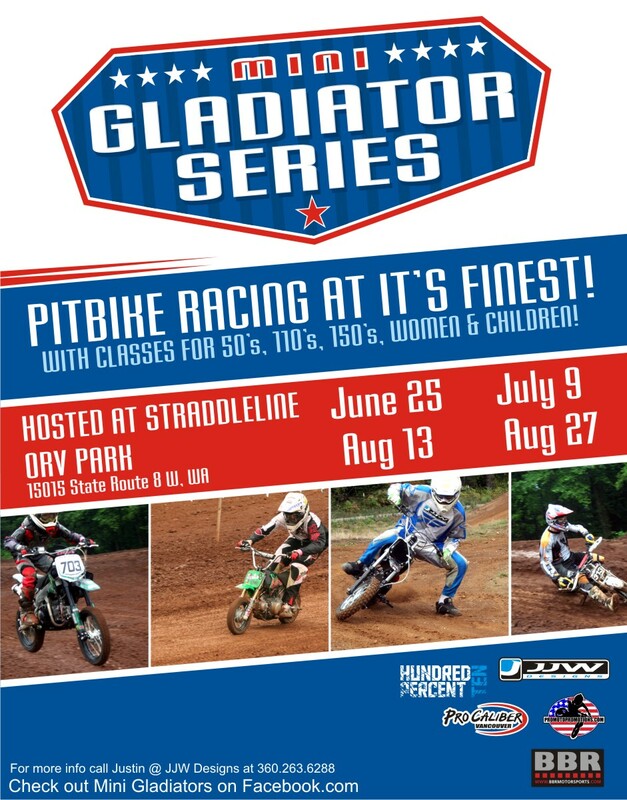 Mini MX Summer Grand National - Spokane, WA - Update! March 22nd, 2008 North Plains, OR. BBR Announces Sponsorship of 1st Annual US Mini Roadrace National. Derek Costella wins the 12'' Expert class at the Del Mar Mini SX. Buck Bodrey wins back-to-back races on his BBR Perimeter Frame CRF50. $15,000 Pro Purse and Amateur Prizes - Sept. 15th, 2007. 1st Annual 150R Championship Great Success. BBR/Monster Energy Race Team for 2007 MiniMoto SX in Vegas. Seattle, WA - Team BBR/Monster Energy announces the official rider line-up for MiniMoto SX 2007. 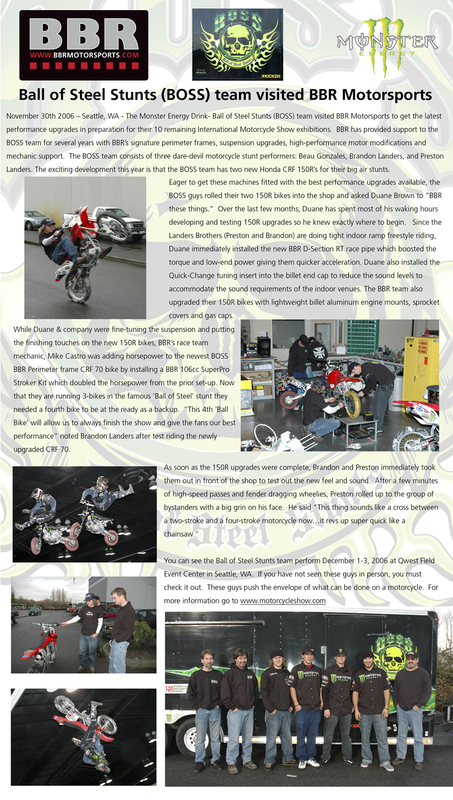 Seattle, WA.- The BBR/Monster race team has put the finishing touches on the 2007 Derek Costella race bikes. Maxxis MiniMoto SX hits Las Vegas May 3-4! Team BBR Monster Energy posts multiple wins at round one of the Mini MX championships at Competitive Edge MX Park. Bob and Linda Langin pulled off another fantastic race in their Thousand Oaks backyard! BBR Motorsports Mini 4-Stroke Indoor Championships. A day of fun racing in Monroe, WA. BBR does the White Brothers Annual four-stroke race in San Bernardino, CA. Screwy Dilla 2003 was a huge hit! As usual, Scott ''Screwy'' Sherbert went above and beyond for one of the best races of the year. BBR goes to Langtown in Sunny California. This year's Screwy-Dilla (September 2002) was the best ever! Washougal, one of the most beautiful tracks on the national motocross circuit, is less than four hours away from BBR. BBR goes to Portland, OR to take part in the Arenacross. US Open 2001 - Viva Las Vegas! The US Open was a success. 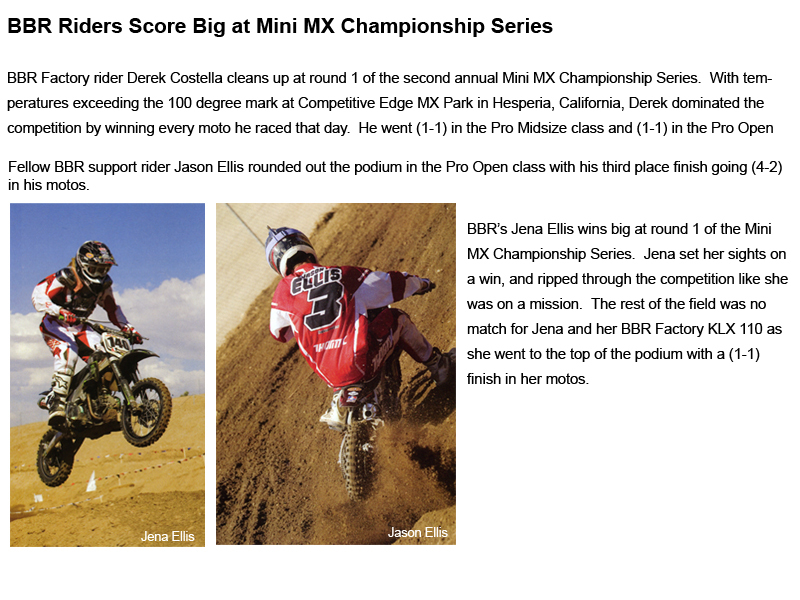 Ten magazine editors raced 10 BBR 150s, with MX Racer claiming two podium spots. Scotty ''Screwy'' Sherbert of Screwy Designs hosted the second annual Screwy-Dilla BBQ and mini-bike race on September 22.